The NEFMC seeks applicants who are interested in serving on its Scientific and Statistical Committee for the upcoming three-year term, beginning in January 2016. The Council may potentially fill more than one vacancy. Qualified individuals should have demonstrated expertise in one of the following: as an economist, fisheries scientist with expertise in population biology, or in marine ecosystems. The deadline for applications is November 18. If you are having trouble opening the attachment which contains more complete details, please go to the Council’s website – RequestforSSCApplicants_3-yr-term.pdf. If you have questions about the SSC, the work it does and the time commitment required, please contact Chris Kellogg at ckellogg@nefmc.org or 978 465 0492, ext. 112. IFFO, the trade association for the global marine ingredients industry, will see the retirement of Technical Director Dr. Andrew Jackson at the end of 2015 after ten years of great contributions to the organisation. IFFO will be joined in November by Dr. Neil Auchterlonie – taking over as Technical Director from 1st January 2016 after a two month handover period with Dr. Jackson. Dr. Auchterlonie has B.Sc, M.Sc and PhD degrees in Marine Biology, Applied Fish Biology and Aquaculture, and has spent time working in technical and production positions in aquaculture companies and government department and research agencies. Neil has a strong track record in managing aquaculture and fisheries science programmes in both public and private sector, specialising in commissioning, managing and reporting on science that addresses policy questions for both government and industry. U.S. Senators Susan Collins and Angus King today announced that the National Oceanic and Atmospheric Administration (NOAA) will award $244,040 to the University of New England to determine best capture-and-handling methods and promote survival for Atlantic cod unintentionally caught in lobster gear in the Gulf of Maine. This project will evaluate Atlantic cod released from standard lobster gear. Transmitters attached to the cod will allow scientists to analyze mortality data on cod released from lobster traps. Researchers will then be able to use this data to provide best practice recommendations to determine how cod can best survive capture in lobster equipment. This grant funding was awarded through the NOAA’s Bycatch Reduction Engineering Program (BREP). BREP supports the development of technological solutions and changes in fishing practices designed to minimize bycatch. Bycatch is a fish or marine species caught unintentionally while fishing for a different species. 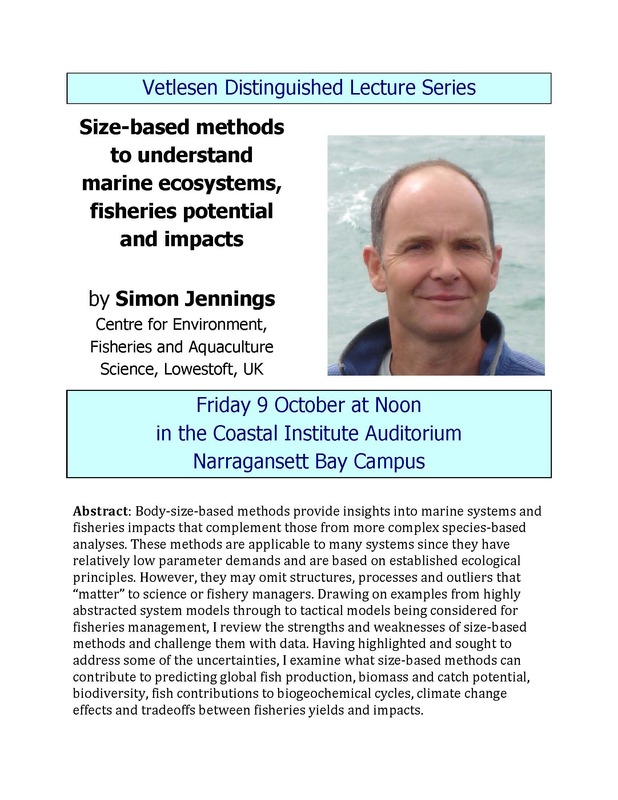 Abstract: Body-size-based methods provide insights into marine systems and fisheries impacts that complement those from more complex species-based analyses. These methods are applicable to many systems since they have relatively low parameter demands and are based on established ecological principles. However, they may omit structures, processes and outliers that “matter” to science or fishery managers. Drawing on examples from highly abstracted system models through to tactical models being considered for fisheries management, I review the strengths and weaknesses of size-based methods and challenge them with data. Having highlighted and sought to address some of the uncertainties, I examine what size-based methods can contribute to predicting global fish production, biomass and catch potential, biodiversity, fish contributions to biogeochemical cycles, climate change effects and tradeoffs between fisheries yields and impacts. International experts in fisheries management have come together as part of a new initiative, called CFOOD (Collaborative for Food from Our Oceans Data.) The coalition will gather data from around the world and maintain fisheries databases while ensuring seafood sustainability discussions in the media reflect ground-truth science. The CFOOD project, headquartered at the University of Washington’s School of Aquatic and Fishery Sciences (SAFS), is made up of a network of scientists whose mission stemmed from a frustration with erroneous and agenda-driven stories about fisheries sustainability in the media. The CFOOD project will maintain a website and social media channels that provide a forum for immediate feedback on new seafood sustainability reports and studies. “The CFOOD website allows us to offer independent scientific commentary to debunk false claims, support responsible science, or introduce new issues based on recent research,” said Dr. Ray Hilborn, Professor at University of Washington’s SAFS and founder of the CFOOD initiative. By reviewing and providing scientific analysis on relevant studies, papers, and media reports the CFOOD network hopes to use science to set the record straight for consumers, so they can have confidence the seafood they purchase is harvested in an environmentally responsible fashion. Other scientists on the editorial board for CFOOD include Robert Arlinghaus, Leibniz-Institute of Freshwater Ecology and Inland Fisheries and Humboldt at Universität zu Berlin; Kevern Cochrane, FAO Retired, Cape Town, South Africa; Stephen Hall, World Fish Center, Penang, Malaysia; Olaf Jensen, Rutgers University; Michel Kaiser, Bangor University, UK; Ana Parma, CONICET Puerto Madryn, Argentina; Tony Smith, Hobart, Australia; Nobuyuki Yagi, Tokyo University. “Exaggerated claims of impending ecological disaster might grab attention, but they risk distorting effort and resources away from more critical issues. I hope this initiative will help provide the balance we need,” said Dr. Stephen Hall, Director General, World Fish Center, based in Malaysia. 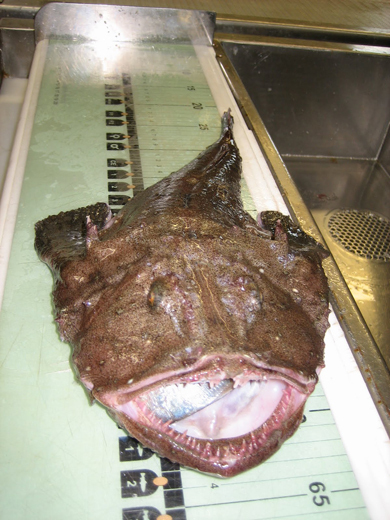 NOAA Fisheries, in coordination with the New England and Mid-Atlantic Fishery Management Councils (Councils), is soliciting monkfish research proposals to utilize 500 Monkfish Days-at-Sea (DAS) per year that have been set-aside by the Councils to fund monkfish research through the 2016 Monkfish Research Set-Aside (RSA) Program. Read the announcement summary or the full announcement on our website, or go to Grants.gov and use the following funding opportunity number: NOAA-NMFS-NEFSC-2016-2004598. Questions? Contact Cheryl Corbett, Northeast Fisheries Science Center, 166 Water Street, Woods Hole, MA 02543, by phone 508-495-2070, fax 508-495-2004, or email at cheryl.corbett@noaa.gov. 2015 American Lobster Benchmark Stock Assessment and Peer Review Report – Please note this is a low resolution version; a high resolution copy of the report can be obtained at https://asmfc.egnyte.com/dl/kJfBicPSNR. August 19, 2015 — Sustainable scallop fishing within the Cardigan Bay Special Area of Conservation (SAC) could be possible, thanks to the world’s largest ever fishing impact study led by scientists from Wales’ Bangor University. Bangor University worked together with the Welsh Fishermen’s Association, Welsh Government and Natural Resources Wales for the study, which focused on understanding the amount of scallop fishing within the SAC that would be considered sustainable and that would not damage the conservation features of the area. “This is the first study of its kind that provides information that would enable us to advise on the amount of fishing that the seabed within the SAC can tolerate, it provides the basis for a truly ecosystem based approach to management of a potential fishery in the area,” said Professor Michel Kaiser who leads the fisheries and conservation science group at Bangor University’s School of Ocean Sciences. The Gulf of Maine Research Institute will be facilitating a FishTank Workshop entitled “Taking Stock: A Workshop to Collaboratively Improve Assessments”, taking place on November 9 & 10, 2015 at the Radisson Hotel Plymouth Harbor, 180 Water Street, Plymouth, MA 02360. · sharing ideas with NOAA Fisheries on improving communications around stock assessments. From these meetings, it is our intent through this workshop to develop plans to take action on industry recommendations, discuss how data from research projects can be integrated into the stock assessment process, and determine best approaches to obtain funding for project ideas. We also hope to have panel sessions to showcase other initiatives in the region around improving stock assessments, as well as results from relevant collaborative research projects in the region that may inform stock assessments. The Mid-Atlantic Fishery Management Council (MAFMC) is soliciting applications from qualified individuals to serve on the Northeast Trawl Survey Advisory Panel. The objectives for the panel are to understand existing NEFSC trawl survey gear performance and methodology, evaluate the potential to complement or supplement current NEFSC surveys, and to improve understanding and acceptance of NEFSC survey data quality and results. The panel will identify concerns about regional research survey performance and data, identify methods to address or mitigate these concerns and promote mutual understanding and acceptance of results. The panel will consist of 16 members including members of the Councils and the Atlantic States Fishery Commission, industry experts, non-federal scientists and Northeast Fisheries Science Center scientists. Panel members are expected to serve for three years. Please include “TRAWL SURVEY ADVISORY PANEL” in the subject of your fax or email. Completed applications must be received no later than 5:00 p.m. on Tuesday, August 4, 2015. All nominees are subject to an additional level of review by NOAA’s Office of Law Enforcement and may be declined membership because of a marine resource violation.